The scientific name of the Australian Cashew Nut Tree is Semecarpus Australiensis. They grow naturally in monsoon forests and can be found in Cape York, the Queensland wet tropics, and Northern Territory. The threes have dark green leaves and cream-coloured flowers. 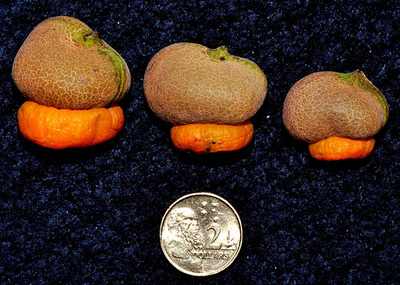 The fruit it produces is unusual in that the seeds hangout outside in a leathery pod. They taste similar to common cashews, but the fleshy fruit it is attached to is smaller. Cashew apples and cashew nuts need great care in preparation because the sap causes extreme skin irritation. Aborigines cover their hands in clay before touching them, and this is why they are always bough shelled.